Author Lee S. Hawke's DISSOLUTION asks the question, "What would you sell yourself for?" In Hawke's world of Unilox, before a person turns 18, they are put through a series of trials, testing, and more testing in hopes of getting bid on at the Auctioning by major corporations. Corporations like ANRON, HARLIN, MERCE, PERCO, AND DRAYTH run Unilox with a tight grip. Everyone wears a UCONN to track them, a white uniform so they don't stand out to anyone else, and a collar to show that they are products to be bought and sold. DISSOLUTION's protagonist is Madeline XKC2501. Madeline is eager to begin life as a mech-head with MERCE and make thousands of credits. She's really good at tinkering and putting things together. But at the moment, she actually belongs to Anron Life Unlimited. They hold her contract. They put her through rigorous testing, and they hold her life in their hands. They've also been pretty secretive about what is in store for her once she turns 18. But, Madeline knows things aren't exactly as she believes them to be when she gets a funny feeling that the world has shifted without her knowing what happened. When the actual Auctioning comes around, and Madeline is left out in the cold, I felt a cold chill running up my spine. Too many things just didn't add up, including the way the doctors treated her. I put all the blame on Madeline's parents. Not to spoil things, but they play more than a bit role in Madeline's auctioning coming and going without being called. After choosing to run away, instead of giving herself up to Anron's leg breakers, Madeline survives a tumble in a toxic river and discovers that there is an entirely different world right under the surface of Unilox. The underlying message of DISSOLUTION to me was, what happens when your hopes and dreams go up in flames because of something you had nothing to do with? Are you actually a person, or an experiment, or a drone who can be bought and sold without you having any voice in what happens to you? Do corporations really care about your welfare and your desires or do they just use you until you die doing the same job? What are corporations? Are they a group of people with similar views working together to make profits? Or, are they really there to help people better their lives? Madeline's journey, albeit a short one, is nonetheless enlightening as well as dark. Characters come and go, especially her boyfriend Jake who she has to pay in order to date, and a professor who tries to help her. There is also the darker underground that Madeline discovers upon escaping mercenaries paid to bring her back. One could say that Hawke used a bit of social commentary to show how corporations actually treat those that they hire. I suppose one could say that whenever you apply for a job or write your cover letter, and resume, you are, in fact, selling yourself to the highest bidder to do with you what they like. If you want the job, more times than not, you will say yes. Yes, you may get a bonus, or health care, or vacations, but are you really in control of your own life? 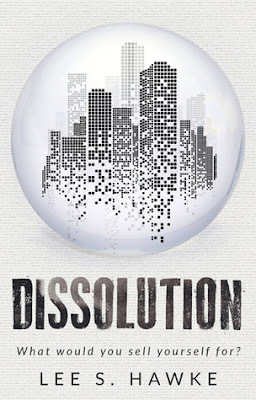 My only regret in reading DISSOLUTION is the ending, but what else is new? I mean, I enjoy dystopian novels and no, I do not believe they are at the end of their usefulness like vampires and Urban Fantasy was thought to be a few short years ago. But, sometimes authors do the silliest things to wrap up their stories. This is yet another case of either pure genius on Hawke's part, or plain evil. Madeline is a likable character who gets no respect. She fights for her dreams, and then reality hits her hard. Nuff said! I received this galley from Xpresso Book Tours in exchanged for an honest review. This sounds really interesting but maybe not quite my kind of read. I loved your honest review and thoughts so thanks so much for them! Hmmm... hmm.... I honestly don't know what to say. This book is so unlike anything I've ever heard of and it sounds very twisted, too. Not sure if this is a good or bad thing. I'm intrigued by your review though. It definitely sounds like something that would have me wondering what the author had in store next. Sounds like a social satire with the backdrop being what it is, but I do like reading these types to ask the hard questions and still get an exciting story. This sounds like it can definitely relate to real life right now and what things could become in the future. Yikes! It definitely sounds intriguing! Glad you enjoyed :) It sounds rather interesting! And yes, authors can wrap things up not so great for the reader sometimes. Wow Shelley, what a great premise and its short and sweet I like that and may just give this one a try. Thanks! Ugh, I hate this type of manipulation. I think free will is something very important and having control over ones's actions. Great review!! Sounds interesting. We all have a price. Short and a not so good ending. Hmm... Not sure. What the actual f*ck? this sounds kinda creepy but also I'm super interested to find out whats going on.